In this project (published 2011 in Estuaries and Coasts), we developed a spatially explicit global overview of nearshore coastal types, based on hydrological, lithological and morphological criteria. Four main types are distinguished, they act as filters of both dissolved and suspended material entering the ocean from land: small deltas (type I), tidal systems (II), lagoons (III) and fjords (IV). Large rivers (V) largely bypass the nearshore filter, while karstic (VI) and arheic coasts (VII) act as inactive filters. This typology provides new insight into the spatial distribution and inherent heterogeneity of estuarine filters worldwide. Types I, II, III and IV account for 32%, 22%, 8% and 26% of the global coastline, respectively, while 12% have a very limited nearshore coastal filter. In this project (published 2005 in Global Biogeochemical Cycles) we developed a new digital map of the lithology of the continental surfaces, targeted to surficial Earth system analysis (chemical weathering, land erosion, carbon cycling, sediment formation, riverine fluxes, aquifer typology, coastal erosion). Rock types include acid (0.98% at global scale) and basic (5.75%) volcanics, acid (7.23%) and basic (0.20%) plutonics, Precambrian basement (11.52%) and metamorphic rocks (4.07%), consolidated siliciclastic rocks (16.28%), mixed sedimentary (7.75%), carbonates (10.40%), semi- to un-consolidated sedimentary rocks (10.05%), alluvial deposits (15.48%), loess (2.62%), dunes (1.54%) and evaporites (0.12%). Where sediments, volcanics and metamorphosed rocks are too intimately mixed, a complex lithology (5.45%) class is added. In the paper, the average composition is then tabulated for continents, ocean drainage basins, relief types, latitudinal bands, geological periods, exorheic versus endorheic domain and for formerly glaciated regions. Surficial lithology is highly heterogeneous and major differences are noted in any of these ensembles. Some of the findings could be expected, such as the importance of alluvium and unconsolidated deposits in plains and lowlands, of Precambrian and metamorphic rocks in mid- mountain areas, the occurrence of loess, dunes and evaporites in dry regions, and of carbonates in Europe. Less expected are the large occurrences of volcanics (74% of their outcrops) in highly dissected relief and the importance of loess in South America. Prevalence of carbonate rocks between 15°N and 65°N and of Precambrian plus metamorphics in two bands (25°S–-15°N and north of 55°N) is confirmed. Asia and the Atlantic Ocean drainage basin, without Mediterranean and Black Sea, are the most representative ensembles. In cratons young sediments often mask the influence of ancient geological periods, while active orogens have a specific composition. Developped as a part of the Geocarbon project , these interactive maps (available at this url: http://www.biogeomod.net/geomap/) consist in a web-based interface, compatible with the most used web-browsers and Operative Systems. 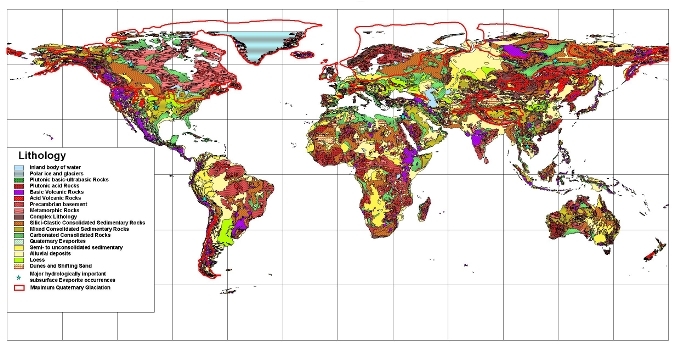 It presents a map of the world displaying 45 regions(MARCATS for MARgins and CATchments Segmentation, Laruelle et al., 2012) including all exorheic watersheds and the continental shelves. The user can select any region of interest by clicking on it and open a pop-up window containing a close up map of the selected MARCATS as well as some geographic information regarding inland waters, estuaries and continental shelf waters. 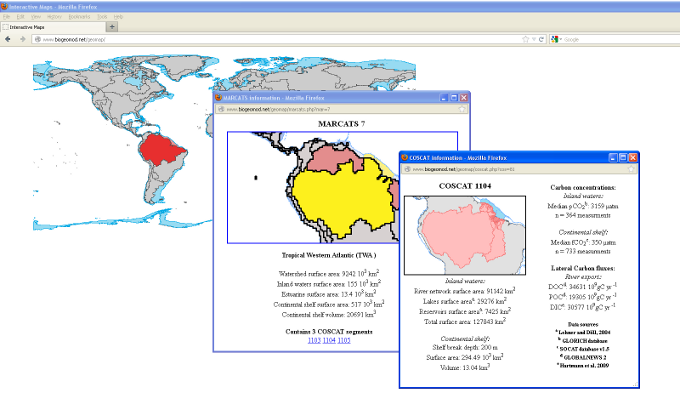 The map also provides the geographic extent of sub-regions (COSCATs for Coastal Segmentation and related CATchments, Meybeck et al., 2006) which can also be selected by the user. An additional pop-up window then opens with a zoom on the selected COSCAT. This window also provides a number of information about the selected zone. This comprises: the surface area of inland waters (separated into river network, lakes and reservoirs), the surface area, volume and breaking depth of continental shelf waters, the integrated annual lateral Carbon fluxes between inland waters and estuaries (separated into Particulate Organic Carbon, Dissolved Organic Carbon and Dissolved Inorganic Carbon; Seitzinger et al., 2005, Mayorga et al., 2010, Hartmann et al., 2009), median pCO2 in inland waters extracted from the GLORICH database as well as the number of samples this value is calculated from and median fCO2 in continental shelf waters extracted from the SOCAT 1.5 database as well as the number of samples this value is based on.